MVT™ Metering valves are constructed of PTFE and PCTFE materials. Non-fluid contacting external parts are made of anodized aluminum. 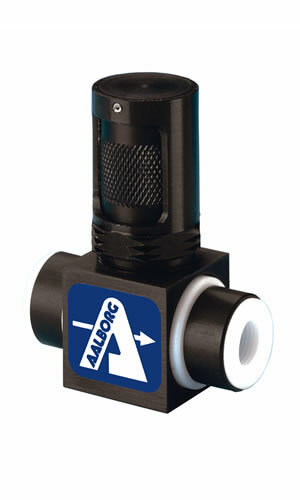 Valves are offered in three conveniently overlapping flow ranges. Safety handle prevents over tightening and facilitates fine metered regulation. MVT™ valves are useful in regulating the flow of corrosive gases and liquids. They may be used in pressure or non-critical vacuum service and serve as bubble tight shutoff valves. NON-FLUID CONTACTING MATERIALS shell + handle - aluminum (black anodized).